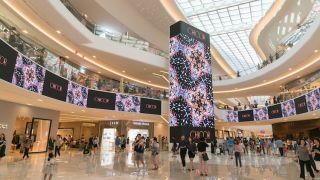 LED display solutions provider Absen has collaborated with Starfield Goyang Mall, the largest indoor shopping theme park in Korea’s northwestern area, to enhance the facility’s customer experience. Opened in the fall of 2017, Starfield Goyang Mall was designed to address the underserved residential area northwest of Seoul, South Korea. The mall covers 135,500 square meters featuring 560 global and domestic brands as well as 100 restaurants and eateries distributed in three food courts. Starfield Goyang includes Shinsegae Department Store, wholesale discount store Emart Traders, Aquafield spa and water park facility, Sports Monster indoor sporting facility, a movie theater, and other entertainment facilities. To keep with the entertainment environment, the mall leveraged the latest in LED display technology by Absen LED to create a video wall in the large curved rotunda area of the mall. There visitors are engaged by a 50-foot-high and a 24-foot-wide curved video tower composed of 360 3.9mm panels displaying various advertisements as well as customized content created by Montreal-based Moment Factory.